When NCWTS has demonstration projects being constructed or tested, we often install a webcam at the project site so that you can view the construction process and observe the use and wear of the demonstration bridge. Check in frequently to see the updates, and watch for research reports that outline project results. A project is currently in progress to design, construct, monitor, and evaluate a glulam girder bridge superstructure placed on Geosynthetic Reinforced Soil Integrated Bridge System (GRS-IBS) abutments. The bridge replaces a solid-sawn timber stringer bridge that was built in 1930. Instrumentation will be installed to monitor several performance parameters of the new structure in order to evaluate performance characteristics of the bridge superstructure, approach roadway, and GRS-IBS abutments. 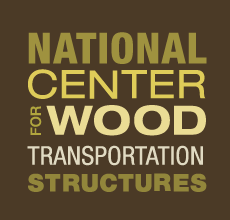 This project is a cooperative effort between Iowa State University, U.S. Forest Service, Forest Products Laboratory, Federal Highway Administration, Buchanan County, Iowa and Laminated Concepts Inc. of Big Flats, New York.